While the tech world is still reeling from Samsung's introduction of the Galaxy S3 Mini, reports surfaced on Friday claiming that yet another exciting new Galaxy phone is in the works at the Korean company. Called the Galaxy Premier, the new device is rumored to lie somewhere between the Galaxy S3 and Samsung's Galaxy Nexus in tech and scope. What's now being called the Galaxy Premier appears to have surfaced for the first time in late September, when a photo taken by an unknown device with the model number GT-i9260 appeared online. At the time, the unknown device was assumed to be Samsung's Galaxy Nexus 2, but the Galaxy Premiere is more than a simple Nexus successor. The rumor about the Samsung Galaxy Premiere first appeared on German site Mobile Geeks, which may have caught wind of the device at the same event at which the S3 Mini was unveiled. The exact origin of the Galaxy Premier rumor is unclear, though, and TechRadar reached out to Samsung for clarification, though the company hasn't yet responded. Either way, the information that's currently available suggests that the Galaxy Premier may only be planned for European markets at this time. 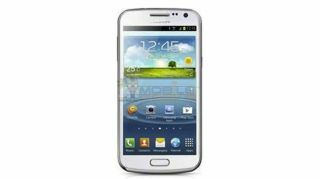 The Galaxy Premier carries specs that place it in the middle territory somewhere between the Galaxy S3 and Galaxy Nexus, with Android 4.1: Jelly Bean and a 1.5GHz dual core processor. The Premier is said to pack the same display size and resolution as the Galaxy Nexus, with a 4.6-inch 1280x720 Super AMOLED screen. According to the reports, the Premier also features a 8-megapixel camera, Bluetooth 4.0, NFC capabilities, and DLNA. Hopefully, more concrete information about the Galaxy Premier appears soon.